We were able to visit one of our great longboard skateboard vendors: “SDS skateboards / Stella Longboards”. They are based in Rancho Cucamonga near Los Angles California, and it took us about 6 hours to drive from San Francisco. SDS skateboards is the wholesale distributor of Stella longboards, skateboards, skateboard accessories and protective gear for the outdoor action sport. We got a cordial welcome from Mark the sales rep and Winston the general manager who came right away into the lobby to greet us as we arrived. The grant tour was waiting and we got to see where the actual work happens. The warehouse. The first thing you see is a big cool wall covered with pictures and words. The words SDS skateboards sign jumped out. And yes there is space for skating :) Many models were available to try out. 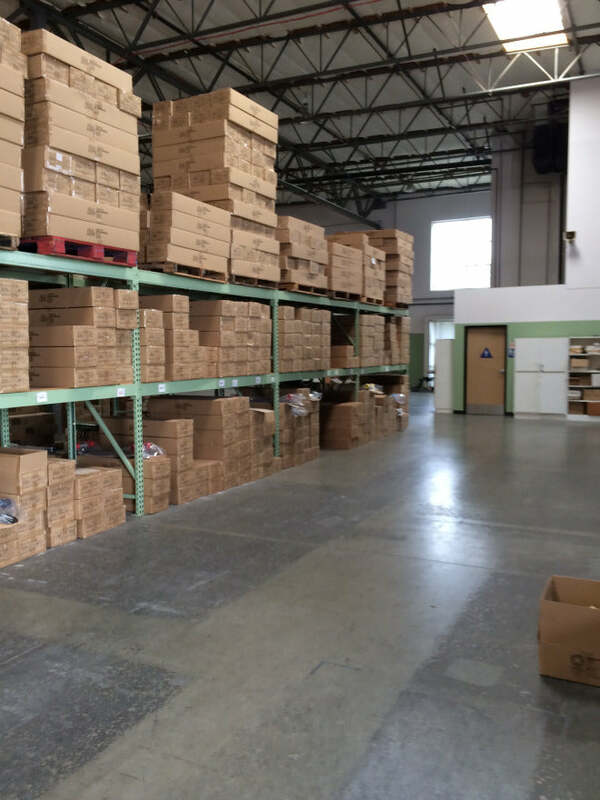 SDS has a big warehouse with lots of longboards and skateboards stacked and ready to ship. It looks well organized by longboards model, all skateboards and then the accessories. Very well organized storage space. We were able to see the new longboards that just came in and tried a couple. It looked and felt very durable, smooth and sturdy. We definitely enjoyed riding them. 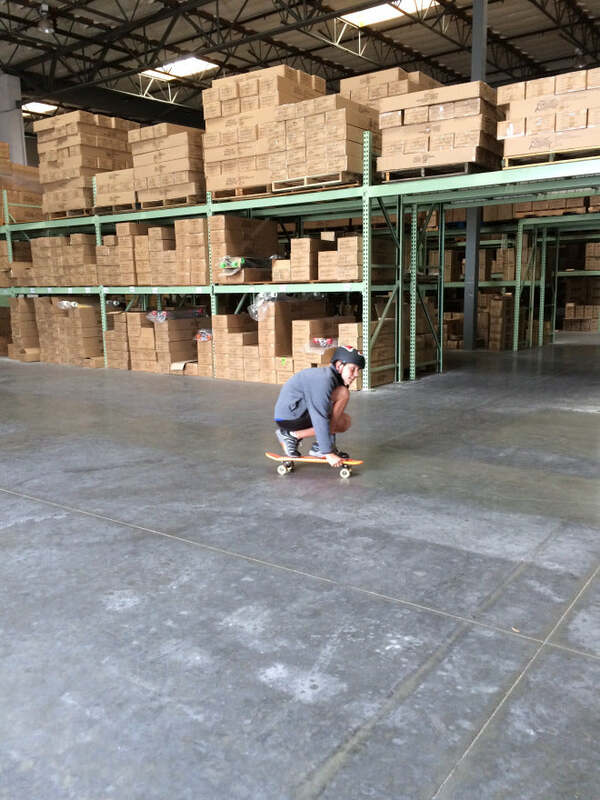 Their co-worker was busy assembling longboards, packing them and getting them ready to ship and he cruised around on his own longboard to get the right packages. If you had to walk to each package, you will walk miles each day. Winston explained the process of getting the graphics on the boards with the heated press, while Mark explained the essentials of the boards. We also saw the great new and improved Mondo Wheels. As a team racer, Mark Barfield (@mcbarf2468) believes they are the best! Our son got to try an orange nickel board and loved it and have been shredding on it ever since. This visit was a very excited and informal. They are working hard and doing a great job manufacturing and selling quality products. Stella has excellent 2015 longboard models and we also got a peek at next year’s line-up and lots of exciting stuff is coming more about that in the future. Its great to see the continuing innovation and passion the team of Stella brings to the boards. Thanks again for the time and information. Get your Stella Longboard today and start cruising! 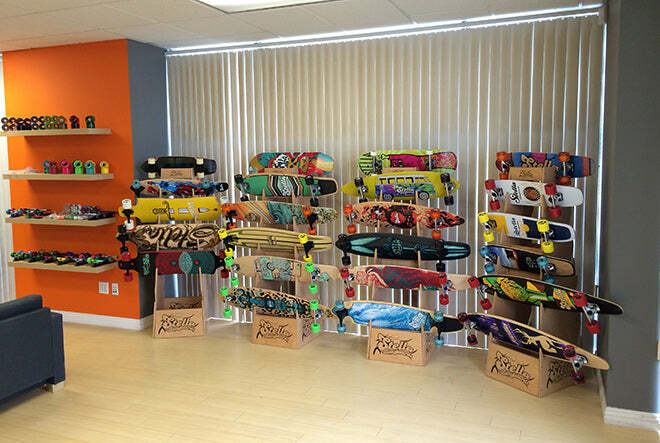 See all Stella Longboards products: completes, decks, skateboards and accessories.